Apple started pre-orders for the iPad mini and 4th Generation iPad early this morning at 3AM Eastern / 12AM Pacific. As noted in our forums, the initial stock of White iPad minis sold out quickly in the U.S. 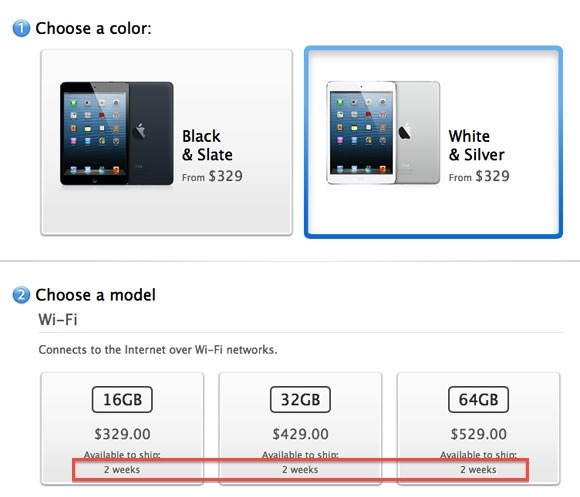 Within the first 17 minutes, ship dates for the white iPad mini slipped to 2 weeks from the original "Delivers 11/2". The black Wi-Fi iPad mini remains available for delivery by November 2nd. Of course, its hard to tell how much of the stock out is related to high demand vs. low supply. We suspect stocks may have been low as others have noted that countries outside the U.S. listed "2 week" delivery times from the first moment the white iPad minis went on sale. As typical, Apple will also offer the iPad mini in retail stores on launch day. Apple keeps a sizable stock of devices to be available on the official launch day of products. The Wi-Fi iPad mini will be available in retail stores starting on November 2nd. Meanwhile, the cellular version is promised by mid-November. Apple never ran out of anything while Steve was there. Really??? And you are from which parallel universe? And yet I'll still be able to casually saunter into an Apple Store on Nov 2, not queue and pick one up as if I'm buying a loaf of bread. My guess is that this very much depends on which Apple Store you will be sauntering into on Nov 2.
wow, that was fast .... but than, I think they never made any iPhone/iPad available in so many countries at once. Anyway, it will be a big success - no matter how many people predict it to fail. Not true, and you know it. On the other hand, they have changed the size of every product already. Now, where is the innovation again? Jesus Christ. They did run out of product before. They are so sorry that they are more popular than before and can't force more factory workers to work more double shifts. Retina Macbook 15 and 13, the new iMac, the innovative manufacturing processes, dynamic Lighting cables, developing Thunderbolt with intel, the thin iPod Touches, etc. etc. etc. You are just complaining to complain. Seems like a Apple Rumor site isn't for you. No iPad is bought because Apple can't keep up with supply. I don't know why they can never make enough. Secrecy is already out the window, so there's presumably no disadvantage to ramping up production early to make enough. Seriously? You don't know why Apple can't magically manufacture enough units to meet initial launch demand? Leaving aside all the practical problems (component supply, overall production capacity of the manufacturer(s), massive amount of inventory sitting in boxes rather than being sold, initial production / process issues etc) they'd likely have to ramp up to a higher production level than they'd need going forward which is incredibly wasteful (not to mention stupid). Someone mentioned it's not as big a launch as the iPhone 5 but surely that's to be expected. This is a new product after all and you just don't launch a new product with the sort of production volumes you do for an established product that dominates its market. Dear lord, this post is absolutely embarrassing. Sorry maybe I went a bit overboard but it's just a great day for our team. :D Another successful product launch that demonstrates we're still winning by a wide margin. Huge numbers of pre-orders, incredible profits to follow, and technology that is so remarkable some people can't believe it's real. If you don't actually work for Apple, you just double downed on being a douche.